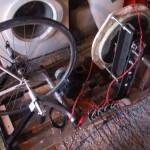 Hugh Piggot inspired, pedal generated electricty! Trying to find a way of coping with the polluted Beijing air, Matt Hope has come up with ‘The Breathing Bike’. The notion that his setup produces 5,000v makes me green with envy! The video was produced by the “Cool-Sparks” team of Xiao Li Tan & O Zhang – whose aim is to “profile cool people doing inspiring work”. 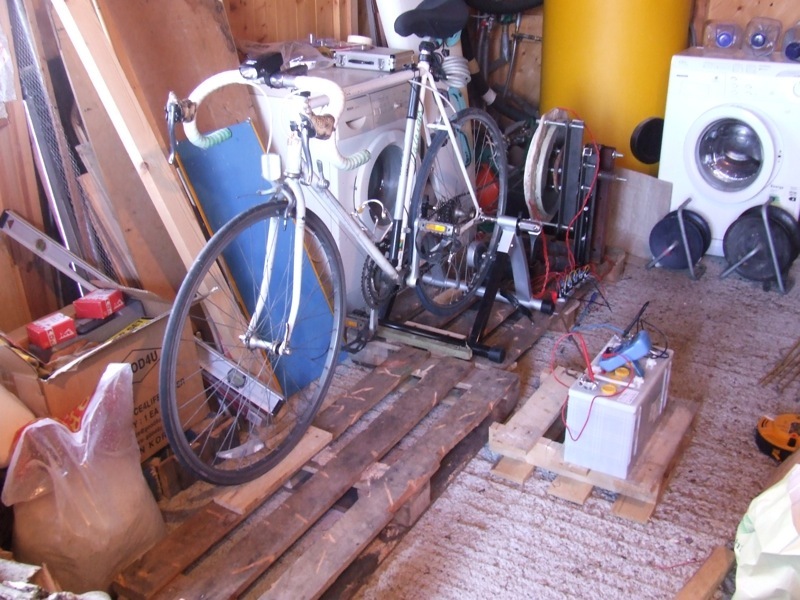 This entry was posted in Blog, Others and tagged bike generator, human generated electricity, pedal electricity generator on February 10, 2013 by Sean Callagy. The mobile phone was busy taking video and pics. The frame was viewed from all angles. The bike was pedalled up to 20kph. Twice. The tyres were metaphorically kicked… and so the ideas emerged gently into the nurturing silences between the three of us. Two local lads, each with their own, quite different electrical needs, came to visit. Both were keen to try pedaling – and were pleasantly surprised at how easy it was to overcome the inertia and resistance. It was nice to see their reassurance. Also nice to realise our chat has saved them time, energy and frustration by helping them steer clear of some pitfalls. 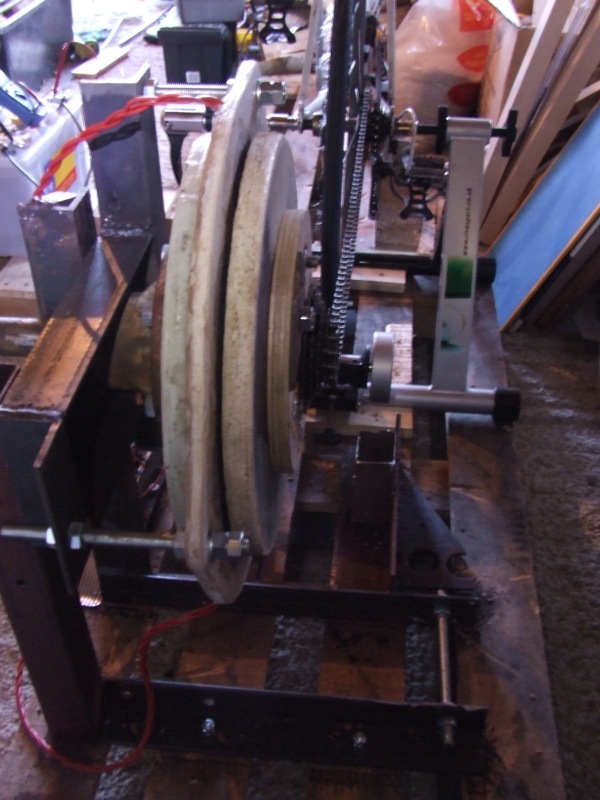 Like making sure your alternator frame design makes it easy to align the turbine with the bike chain. Or exactly centering the sprockets on the front of the alternator hub (because the 5mm off-centre alignment I have is causing immense chain-wobble and vibration at higher speeds). Thanks to their different needs it looks like they make two very different turbikes. Both intend taking plenty of photos and I hope to visit them often during their work. So both their projects will be documented here in time. Check back here. Or like this Facebook page to stay up to date. 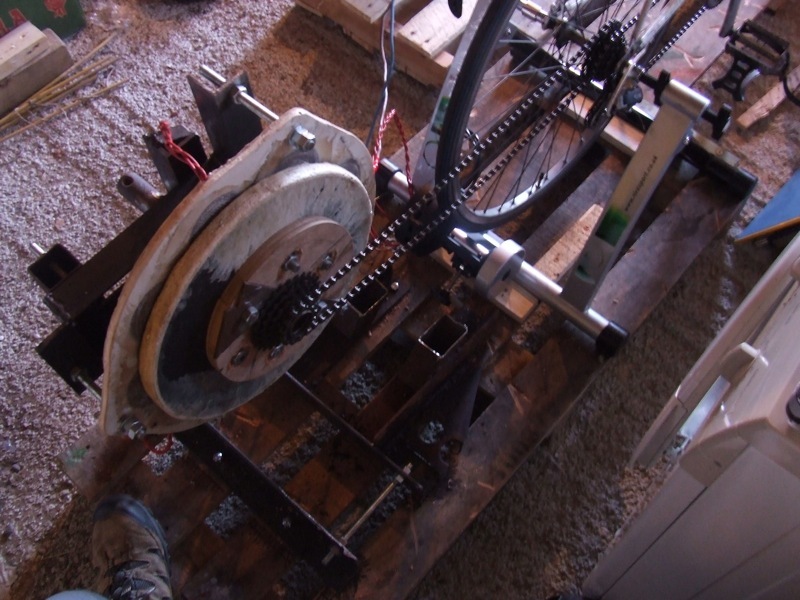 This entry was posted in Blog, Others and tagged alternator, alternator frame, bike generator, DIY wind turbine, human generated electricity, turbike on December 7, 2012 by Sean Callagy. A few hours measuring, looking and drawing suggested it might take two or more days to break apart the old and invent a new bike stand. Fine if one has the time; but I don’t. 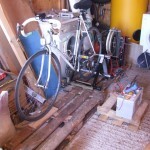 So I ditched the M18 and M20 nuts idea, and moved toward a turbo trainer stand. Jumbletown and Freecycle couldn’t provide so I went shopping. But. given their weight & size, when postage was added to even the basic models I was as well off buying local. However, mounting the whole lot on this particular pallet is not ideal. Because the gyroscopic forces mean the alternator unit tends to jerk toward the bike with each pulse from my pedalling. Which might be okay if the back-end of the pallet didn’t also lift of the floor! The jumping is tolerable at lower pedal rates. But when pedalling at 13.7 volts or more the distance from alternator hub to bike-axle shortens too much during some of the jumps. 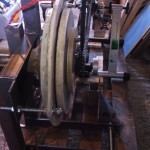 Which causes the connecting chain to jump and clunk badly. This means that not only might the chain fall off at any moment, but the alternator is receiving regular jolts and bangs… not good. Not good at all. So I’m considering two things. Find a good euro pallet (they’re much heavier). Put some serious weight on the back-end of it. P.S. The original mountain bike is on it’s way to Galway courtesy of a fellow Sligo Freecycle Member who had a friend in need there! 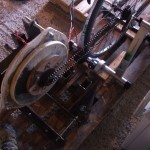 This entry was posted in Bike Stand, Blog, Design and tagged bike generator, electricity, human generated electricity, human power, power, turbike on December 14, 2011 by Sean Callagy. 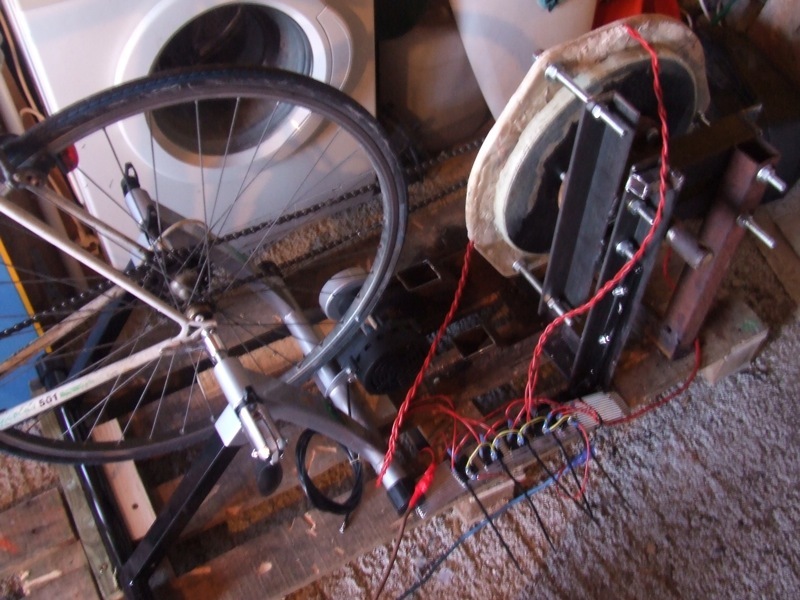 Pedalling… to save a battery?